UI College of Education graduate Ismenia Castelan leads classroom discussion in a West Liberty, Iowa, school. Castelan herself studied English as a second language from kindergarten through third grade. Now the UI College of Education is providing training programs aimed at preparing current and future educators to meet the growing demand for ESL courses in Iowa. Photo by Tim Schoon. Although the first day of school is still weeks away, Rogelio Plascencia, a fourth-grade literature and math teacher from Marshalltown, Iowa, is already back in the classroom. And right now, he’s the student. Plascencia and a small number of educators from across Iowa met recently at the University of Iowa College of Education to learn more about teaching children in dual-language classrooms—in most cases classrooms where children switch back and forth between English and Spanish, spending about half the day learning subjects such as math and science in Spanish, and half the day learning literature and social studies in English. The two-and-a-half-day class was presented by English-learner instruction experts from the UI and elsewhere and was free to participants thanks to a $2.2 million U.S. Department of Education grant awarded to the UI College of Education in 2016. The purpose of the grant is to increase the effectiveness of English-learner instruction in Iowa while also helping teachers become advocates for dual-language learning, which research shows has benefits for both native and non-native English speakers. Read more about UI College of Education graduate Ismenia Castelan on the UI Stories site. College of Education professors David Johnson and Lia Plakans are leading the initiative, called Advocacy, Capacity and Collaboration for English Learners (ACCEL). 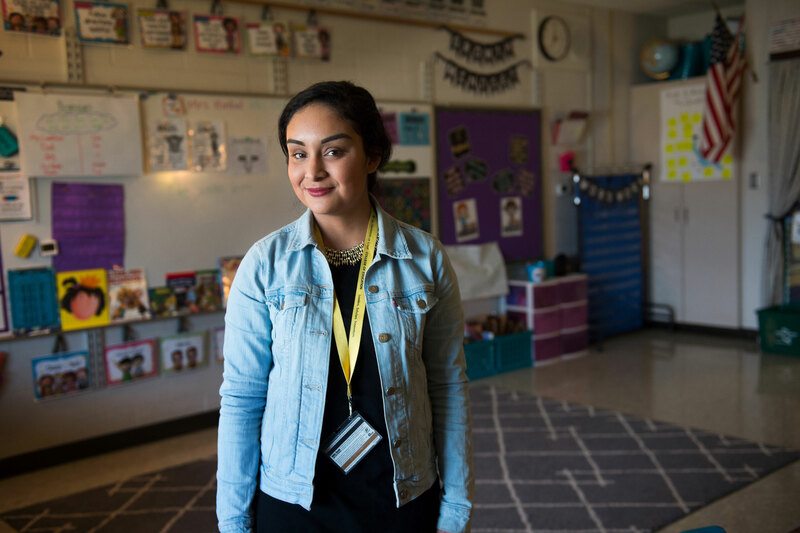 They’re also providing expert support to teachers in Iowa City, West Liberty, and Mashalltown—cities with large populations of English learners—in the form of professional development, classroom coaching, and regular feedback. Johnson and Plakans are also working with elementary education students, including some who participated in English as a second language (ESL) programs as children, who are eager to work in bilingual classrooms. “The grant funding helps us train in-service teachers, train pre-service teachers, and develop our capacity to do both,” Johnson says. Iowa, like many states, has witnessed a large increase in English learners in recent years. School-aged children in Iowa collectively speak more than 200 languages, according to the Iowa Department of Education, and many school districts have found it difficult to recruit teachers with specific training in English-learner instruction. The University of Iowa College of Education offers an endorsement in English as a second language, and Johnson and Plakans would like to add a specialization in dual-language teaching. Johnson says that more parents are starting to request dual-language education for their children because they recognize the benefits it provides, including improved academic outcomes and high school graduation rates. At the recent training, which took place July 24–26, about 20 teachers and administrators from West Liberty and Marshalltown spent long days learning new ways to approach dual-language teaching, including allowing students to speak a mix of Spanish and English, or “Spanglish,” as a way to encourage them to see the etymological and grammatical connections between languages. Plascencia, the fourth-grade teacher from Marshalltown who attended the workshop with several colleagues and his school’s principal, says he appreciated the input from experts as well as focused work on teaching strategies. He says that during his career as a teacher, many things about teaching English learners have changed, including the mix of languages in the classroom. Pamela McDonnell, who oversees English-language acquisition and immigrant education at the Iowa Department of Education, says that while some school districts succeed in finding teachers to work in dual-language classes or with English learners, others wind up with vacancies. She says the UI’s efforts in this area are encouraging.